http://www.line-stickers.com/ – Yu-Gi-Oh! 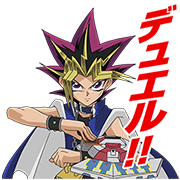 Duel Monsters Line Sticker | Come 2016, Yu-Gi-Oh! will be a whopping 20 years old! Celebrate this momentous occasion with this brand new set of stickers! All your favorite characters from “Yu-Gi-Oh! Duel Monsters” are here to help you say exactly what’s on your mind!